By now playing your ukulele may often consist of looking up chords or tabs to a song and learning the specific chords necessary to play it. This is great in the beginning because it helps increase you chord knowledge; however, you will eventually want to add more to your songs. By adding melodic intros, turnarounds, and endings we end up accessorizing our songs and filling them out. 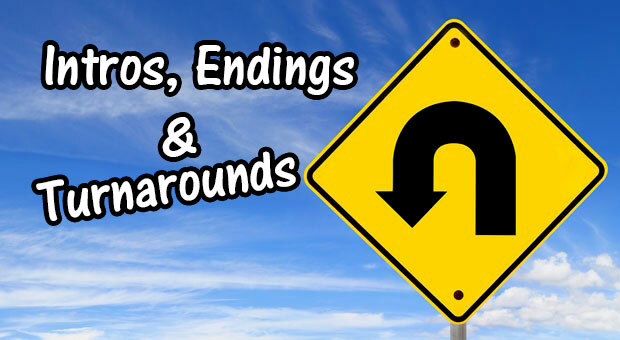 In this situation the terms intro, turnaround, and ending can often be used interchangeably. We are simply learning popular harmonic progressions that help to start, transition, or end a song. Over time you may want to creatively make your own turnarounds and intros for the music you play. Once you have the basics down it is a lot easier to start substituting and experimenting with chords to find that perfect turnaround! The musical idea of the turnaround are chords or notes that lead back into the main section of the music. However, depending on how the turnaround is played it may sound great at the beginning as an intro or even at the end of the song. The most popular definition is the blues turnaround used in twelve bar and similar blues songs, C-F-G7-C. Often the C and F are repeatedly played (sometimes using 7th chords) and at the second to last measure we play G7 briefly before ending on C. By moving to the V7 chord we add tension and transition at the same time back into the I chord. If you don’t grasp the music theory part of it, that is fine, just remember the whole point is to transition back into the main riff of the song. When playing the twelve bar blues that turnaround lets us know we will be playing the verse progression again. Each genre of music has specific turnarounds and common intros or endings that are used. And they all have specific music theory rules, but we can simply use our ears to tell what sounds good. Let’s say you are playing a common progression of C-G-F-C a few times through, at the end play C-G-F-G7-C (The folk turnaround shown above). This will either give the song a nice transition to another verse or it also serves as an ending. Once you have learned some of the more common turnarounds and are familiar with the chords, you can always start fingerpicking single notes. This gives your turnaround a relatable but unique feel (because we are staying in that same familiar progression, just with single notes). We have discussed this common turnaround at greater length in the past, but it doesn’t hurt to review. One of the famous Hawaiian turnarounds is II7-V7-I so in the Key of C that is D7-G7-C. After playing this you will recognize it as a common riff used in between songs and verses in Hawaiian music. When you play these chords slowly you will hear a great descending blues ending. In a way we are still following the pattern above but adding 7th chords in to transition. This is perfect to play at the end of some 12 Bar Blues. With the basic twelve bar pattern and this ending you can have a nice little ukulele blues jam with a few other musicians! This is a simple little vamp that sounds very familiar and can be used with other music or even its only short little tune to fill time between songs! These chords below look a little complicated, but they are not that bad to play and go great as an intro into a song in the Key of C. Augmented and diminished chords can really add some depth and beauty to the ukulele. Often we can take our basic chords used in common turnarounds and by adding 7th, aug, dim, 9th, and such chords we will get a jazzy turnaround. If we take the common Hawaiian vamp above of D7-G7-C and change it to Dm7-G7-C we get a little different feel. Even further more try adding Eb in place of D, a variety of substitutions can be made depending on what else is going on in the song you are playing. Clearly when we get into the world of jazz turnarounds we may leave the boundaries of normal ukulele playing. Yes, some advanced student may wish to dive deeper into complicated jazz transitions, but even the simplest turnarounds are quite effective. Look how many folk and pop tunes go to the V or V7 before returning to the tonic or root chord. You do not have to get all fancy with your ukulele turnarounds, the key is to just find a transition that sounds great and fits in the sound of the song. There are so many examples of turnarounds that it is best to just listen to know when they occur, you will find they are essential to music. Transitions are there to break up the monotony of a repeated verse or chorus. They are also very helpful in a band situation to tell where you are at in a song, once you hear the turnaround you will most likely be going back to the basic verse chord progression. Whether they are used in common or unique ways they definitely add substance to our songs and performances.